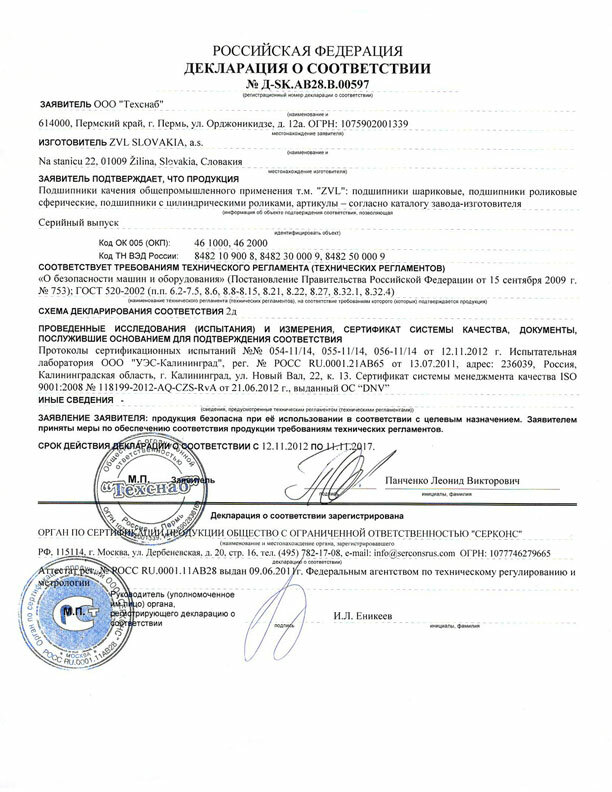 Certificate of conformity for products imported to Russia | ZVL SLOVAKIA a.s.
ZVL SLOVAKIA, successfully completed a certification of ZVL bearings according to Russian standards GOST – R by business partner TECHSNAB, Perm in the Russian market. Certificate of Conformity GOST – R is a document issued in accordance with the rules of a certification system verifying the compliance of quality and security deposits of ZVL bearings valid until 2017. Russia has its own conformity system to control the import and sale of goods and equipment. Certificate GOST – R for products produced in Russia or imported from overseas, confirms the compliance with national standards. GOST means “national standard” and R stands for ‘Russia’. Because there is no treaty between Russia and the European Union on mutual recognition of certificates, experts must examine the certificate to verify that they comply with Russian standards, before products are brought into the country. This certificate may be issued either for a group of products or for mass production. The list of products subject to mandatory certification is provided in facilities of the Federal Agency for technical regulation and metrology.